A large bush with white flowers and black berries. Distribution North Africa, Mediterranean and Europe. Myrtle essential oil is wild crafted from Albania. Steam distilled from the leaves. 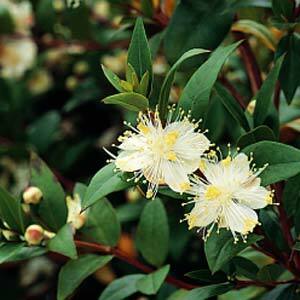 Myrtle oil has a kind of everygreen-y, eucalyptus-y, menthol-y scent but it is kind of flowery too. If I were to blend it I would go for maybe cypress, or citruses or even pine/ fir kind of scents. Myrtle oil seems intrinsically linked with the Goddess Venus and so further, with love. Typically of folklore there are several versions of the origins of the stories. Myrene was the priestess of Venus, who broke the laws of the priesthood by falling desperately in love with a young man. Venus was incensed and turned her into a tree but ordered that she should be evergreen and sweet smelling. Another tale tells that Venus, on the Island of Cyrene used a myrtle tree as a modesty screen when she became embarrassed by her nakedness. Aphrodite is often pictured wearing a myrtle wreath on her head and for many years it was traditional that a brides head dress should be made of it. Cineol, myrtenol, pinene, geraniol, linalol, campene. Myrtle oil is one of the oils that tends to be overlooked in therapy but I have to say I am somewhat an ambassador for it. Those who visit the site often will know that I have an inside interest in all things pulmonary after having a blood clot in my lung when I was carrying Dex and Myrtle has a superb effect on lung pain. I have to tell you that until you have felt lung pain not only can you not imagine it but it is hard to picture how to treat it I am sure. , this oil gave me so much pain relief. So you can follow that through really, use it for bronchitis definitely. In fact it makes a miraculous natural bronchitis treatment because it opens up the chest. It always amazes me how "the ways of the old ones" have prevailed and how medicine like this gets passed down from generation to generation. We refer often to an important herbal text called De Materia Medica written by an ancient Greek writer, Dioscorides in AD65. Dioscorides was a botanist and physician and was so well praised that he worked in Rome serving the then Emperor nero. Materia Medica are his writings and reasoning of how to treat conditions with plants, what I would suppose you would call folk medicine. Even as far back as that, he advises myrtle for chest and breathing difficulties and lung pain. Myrtle is also incredibly gentle and so would be my essential oil of choice if I were to treat a child’s cough, same applies for an elderly person. I suppose you could call in a gentle giant from that point of view. All the strength but with tenderness and care. As one would imagine, when it is so good at dealing with chest complaints, it is a very cleansing oil and is really quite astringent. It would be very effective in treating oily skin as it has very balancing effects. Without doubt is is one of the primary oils if you want to treat open pores or even very inflamed skin. Blend the two qualities together, astringent and gentle and you have an unusual but very useful tool at your disposal. Research papers are also available on the effectiveness of myrtle essential oil versus tea tree in the treatment of candida albacans, where it seemed to perform more favourably. I have to say I would be more inclined to treat atopicaly with this gentle oil than with tea tree which can take your breath away a bit when used neat on ....well lets just say the affected area. You all know what I mean, and I am guessing some of you recall the not so good tea tree sensation too! Revisiting my statement about Myrtle essential oil being balancing, I should draw your attention to the studies done on by Dr Daniel Penoel on how effective myrtle was in levelling hyperthyroidism and imbalance of the ovaries. Some sources also recommend blending with bergamot or clary sage as an aid to stopping smoking...again having never smoked I cannot comment on the efficacy of this. Because of its sedative qualities and its benign effect on nervous issues, it is one of the predominant essential oils to choose for treatment of insomnia. It is also very good for treating haemorrhoids although no matter how hard I try I can't imagine what led someone to think that it may be in the first place! There is nothing in its chemistry that says that it would be. Having said that all the conditions regarding the lungs and the skin are kind of to do with being impacted in some way, so that could be a pointer. For treatment in this way I would suggest a sitz bath with just a couple of drops of oil or even compresses or a lotion. Spiritually myrtle essential oil resonates on the heart chakra (note, chest again...Fascinating, I think) and is useful for "letting go" of the past, in the same way that sweet chestnut flower essence would do. What do you think? Is it a super-oil? I love it but what about you? 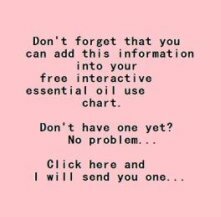 Is it an oil that you use often. Perhaps you can add some more properties to the list? Even better...Have you seen it make dramatic changes? Let us know about how you use it in your therapy...after all we all have really different practices to one another. I'd love to know and hear what you all do. Don't worry if you are a beginner, and just want to ask questions, just get involved! What have you used Myrtle for?